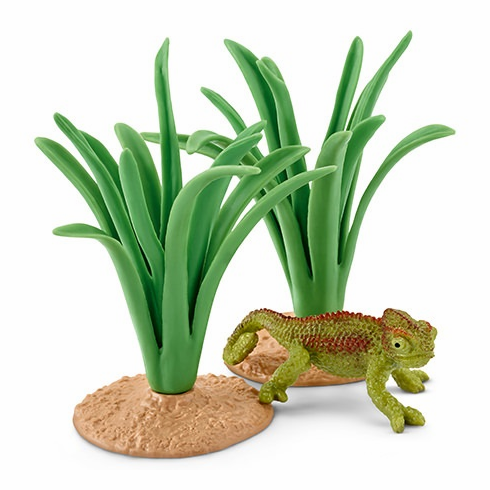 Schleich - Chameleon In Reeds. Thanks to their practical prehensile tails, chameleons can climb really well and hold on to slender branches or reeds. In the process, they often move with a halting or jerky gait. This thus makes them look like a leaf in the wind, both to their enemies as well as their prey. If they become threatened by a snake, a bird or predator, chameleons act as if they are dead or drop to the ground. They change colour depending on their mood. When angry, chameleons turn black, when in love, they display bright colours, and when sick, they become very pale.